Recognizing the hard work of your employees is one of the fastest and most effective ways that small business owners can ensure their staff remains loyal and actively engaged with the company. There are many initiatives these executives can undertake to show workers just how much they care, from implementing officewide programs to promoting employee wellness to providing staff members with small gifts to show their gratitude. If you’re looking for a reason to throw a celebration in honor of your employees, look no further than the end of the business quarter, which provides ample opportunity for exciting and engaging initiatives. Whether you’re thinking about hosting a party for the entire business or you feel as though your employees would benefit from more from tangible items, there are many ways to honor workers during this time. For the past three months, your employees have dedicated a great deal of time, energy and resources to ensure your business runs as smoothly as possible. Honor their efforts by throwing a celebration tailored to their interests. Before picking a location, such as a nice restaurant or bowling alley, survey your workers to discover which activities they enjoy. Would they have fun lounging in the outdoors and talking with their friends, or would they prefer a more hands-on activity to complete with coworkers? 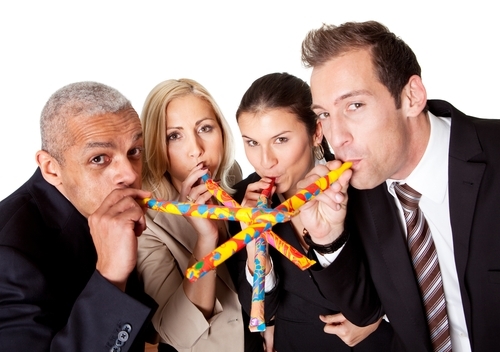 Once you gauged the interest of your employee base, start planning a festive celebration that pertains to their desires. Employee recognition is paramount to success, as workers who feel valued by employers are more likely to stay loyal to the company and produce higher quality work. According to an infographic from Officevibe, employees and office managers alike understand the benefits provided by appreciation programs. The source noted that 46 percent of managers think of these initiatives as an investment instead of an expense, while employee engagement increased by 60 percent among organizations with effective recognition programs. One of the best ways to show workers how valuable they are to the company is by providing them with a tangible gift, such as an item tailored to employee recognition. These incentives can be performance-based, rewarding employees who have hit impressive numbers during the quarter, or officewide, ensuring that all workers have promotional products to take home. Employers looking for a simple gift to distribute among workers should consider the 14 Oz. Promotional Wave Mug, which prominently displays the brand on its side. Alternatively, those seeking a more high-end option for top performers may consider the Status Crystal Clock. In lieu of a companywide quarterly celebration – or to supplement one – consider dedicating an entire week to honoring your employees. Transport workers back to their high school years and ask them to participate in an old-fashioned spirit week, dedicating each day to one specific theme. Your organization can choose traditional options, such as pajama day or opposite day, or they can pick themes tailored to the individual company. As part of your week-long celebration, be sure to host a series of friendly contests among workers, providing small promotional products as prizes to the victors. As you honor your staff for the hard work they’ve completed during the quarter, use this time to present them with a challenge for the next. Whether you prefer asking employees to set personal goals for themselves or you would like to undertake a companywide challenge – such as reaching a specific selling benchmark or participating in healthier initiatives as a whole – there are many avenues to consider. Be sure to set a prize for the end of the challenge, as this may further motivate workers to participate.